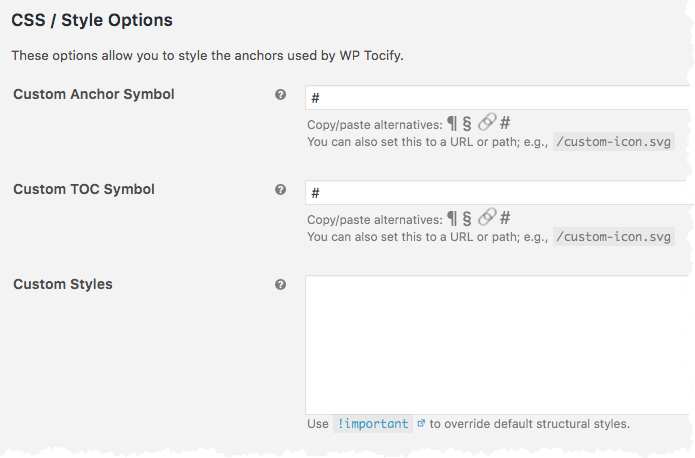 WP Tocify comes ready-to-go, i.e., no configuration needed. However, there are a few options that you can customize if you'd like. In this article I'll walk through each of them, explaining each one a little bit and linking to other articles that go into more detail. 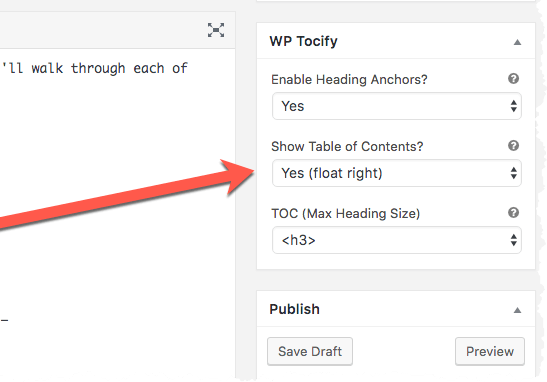 This tells WP Tocify how to find 'the content' in any given Post or Page that you publish. See: JS / CSS Content Selector for additional details and suggestions. This controls <h[1-6]> headings being anchored in an article, by default, or not. In other words, this controls the default setting for each Post where WP Tocify is applicable. When you publish a new Post, what do you want the WP Tocify meta box to contain by default? A value of 'Yes' is suggested here. 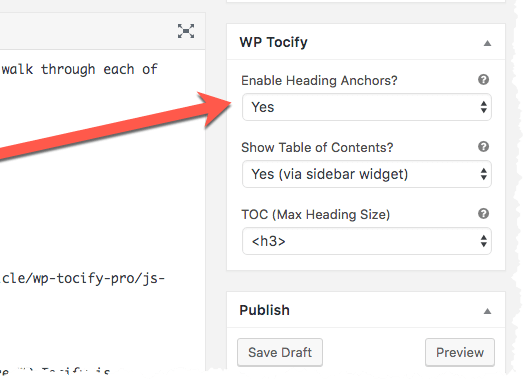 Enabling this option tells WP Tocify to automatically and intelligently adjust the scroll position when an anchored location is being viewed (e.g., /path/to/article/#toc-heading). The benefit of having this enabled is that when you have a fixed top navigation bar (or the WordPress Admin Bar) visible, anchored headings will be offset so they'll appear within the viewport as expected, instead of being covered up by the fixed navigation at the top. This controls the display of a TOC (Table of Contents), by default, or not. In other words, this controls the default setting for each Post where WP Tocify is applicable. When you publish a new Post, what do you want the WP Tocify meta box to contain by default? It's really up to you. It just depends on the type of content that you publish regularly. In either case, you can always control this on a per-Post basis in WordPress. This controls the deepest heading (i.e., maximum heading size in terms of <h[1-6]> in HTML) that will be included in any auto-generated Table of Contents. In other words, this controls the default setting for each Post where WP Tocify is applicable. When you publish a new Post, what do you want the WP Tocify meta box to contain by default? A value of <h3 /> is suggested. Thereby excluding <h4>, <h5>, and <h6> headings, which will make the TOC less specific, but cleaner in terms of visual appeal. However, it is completely up to you. If you want the Table of Contents to contain all of the headings, then set this to 'Show All Headings'. 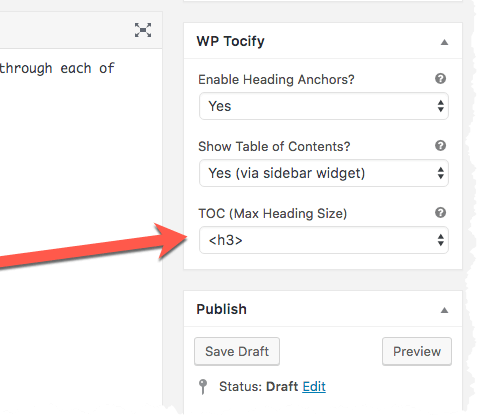 This is a handy feature, because it can be configured in a way that tells WP Tocify to automatically disable the display of a TOC whenever the article contains too few headings. For example, if the article that you write only has two (2) headings, do you really need a Table of Contents? Probably not! So instead of trying to remember when you need one and when you don't, just tell WP Tocify and it will automatically hide the TOC when there are not enough headings to warrant one. We suggest a value of 3. If there are more than three headings, a TOC may help the reader. This allows you to include or exclude Post Types. See: Include/Exclude Post Types for further details. This allows you to customize the icons/symbols and CSS used by WP Tocify. See: CSS / Style Options for further details.